The first day of the racing season at Cartmel, 2019. The Summer starts here – the track will be like a fresh carpet for the horses and we’ll hardly be able to contain our excitement as the runners come under Starter’s orders. Join thousands of racegoers at one of our most relaxed racedays on Whit Bank Holiday Monday for a fantastic afternoon of family fun with a fairground, trade-stands and seven fascinating races. Please note that on concert race days, the admission ticket is inclusive of both the racing and the concert. All persons attending will require a ticket. All attendees must have a ticket including Under 13’s, who attend free (except in the Seated ticket area). The Sunday Funday is the second day of the June meeting and is known for its relaxed atmosphere as a family day featuring children’s entertainers, performers and of course all the fun of the fairground. The July Monday raceday is a relaxed affair with many racegoers choosing to bring a barbie and cook lunch before racing! Don’t worry if you miss any of the exciting racing action, you’ll be able to watch it again on RacingUK. Racing UK day passes are available for just £10, while an annual subscription to RacingUK Anywhere permits you to view races on up to three platforms including mobile, tablet, PC, digital TV and Sky. The final day of the season promises some brilliant high class racing action but this traditional holiday meeting is also about the relaxed picnic atmosphere, the fairground and the family fun. Cartmel Racecourse, in association with Stagecoach, operates a bus service from Cark Station. Priority will be given to rail passengers so please keep your ticket as proof of travel. Tickets are £4 return and are purchased on board. Train services run to Cark-in-Cartmel and Grange-over-Sands Stations, with a raceday bus service to the racecourse running from Cark-in-Cartmel station. 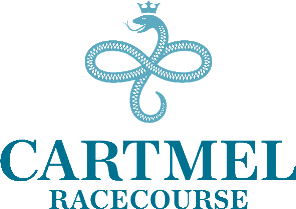 Leave the M6 at Junction 36 and follow the A591 then A590 towards Barrow in Furness for about 10 miles on race days, AA signs direct to the racecourse from the motorway, which is well in advance of the local turn-off the last few miles to Cartmel are along narrow country lanes. On racedays they can be very congested. At peak times it can take some time to travel from the M6, so please allow yourselves plenty of time and arrive early. Car parking in the Paddock Enclosure is limited and costs £6 per car. We encourage you to arrive early to obtain access to the main Paddock car park. This will sell out on Bank Holidays and overflow facilities will be used. Whilst overflow and 7 Acres parking is free, a charge of £6.00 per car will be charged for cars wishing to park within the course enclosure on all racedays. The racecourse welcomes coaches and minibuses free of charge in the coach car park only. Access to this car park is from Cartmel village. Small Camper vans wishing to park in the course enclosure will be charged £6.00. At Cartmel it is requested that racegoers wear smart casual dress in the Paddock Enclosure, especially in the restaurant areas. Although the atmosphere is always informal, it is asked that shirts are worn in all enclosures please. T-shirts and shorts are acceptable in hot weather. Wellington boots and macs are recommended in wet weather. Please dress for your own comfort. Cartmel racecourse is set against the backdrop of the beautiful English Lake District, and here it is possible to sample national hunt racing in its most original format. With its party crowds and funfair, Cartmel rekindles the social gathering tradition of the original steeple to steeple chases. Cartmel only stages National Hunt racing. The course is a sharp and narrow left handed oval. The difference from other courses is the home straight which unusually veers off and dissects the main oval. The main circuit measures just over one mile and one furlong and what is also unique to Cartmel is that the run-in is known as the longest in the country at just over 4 furlongs. The steeplechase course has 6 fences; these include an open ditch and a water jump. The hurdles course has four obstacles. However, as the course is narrow around the last hurdle, it is removed during steeplechase races, and then rebuilt for hurdle events. The narrow track, sharp nature of the bends, stiff fences and undulating contours make it difficult to win from off the pace. The course is ideally suited to front running course specialists.